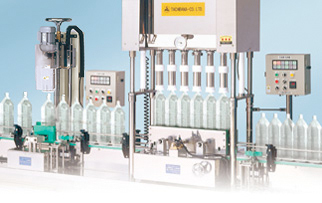 TACHIBANA’s flexible fillers and flexible cappers are innovative machines fill/cap bottles on a straight conveyer. Costs for the sending blades are not needed even if the kinds of bottle changes. Because this filler can be used for all kinds of bottle and PET by original attachments. According to the kinds of bottle, the sending blades should be changed and it costs at least \170,000〜\500,000, moreover, Changing time cannot be neg-lected. When filler is being made by rotary system, some leakage of liquidhappens. But, this filler is keep balance for after fixed on the straight conveyer. And such leakage never happens, moreover, the burden to machine is smaller. Some leakage of liquid occurs. When bottles come to the justice place, they are fixed on the place by the pusher guide. If fixed out of order, safety device operates and make the machine stopand there is no fear of Bottle-Break.Even the women can operate easily in safety. When bottles are being forwarded by the sending blades and fixed out of order, Bottle-Break sometimes happens. As small overhaul, parts fee need about \50,000〜\300,000.(Replacement of part can be made by yourself.) In the case of complete overhaul, it costs about 1/3 amounts of purchasing price for main body.